The name Balfours has been associated with Adelaide for more than a century. For many baby boomers the name conjours up a trip to ‘town’ with mum or grandma and a lunch in the tea rooms that remained a fixture in the city until 2004, although it had been sold by Balfours in the late 80s I believe. It all began in 1856 when Scottish immigrant James Calder established a bakery and shop on Rundle Street, Adelaide, called the City Steam Biscuit Factory. He was joined shortly after by his nephew, John Balfour, in 1877 and the company eventually traded under the name Calder and Balfour. Photo courtesy of San Remo Macaroni Company Pty Ltd Balfours Tea Rooms in Rundle Street. In the 1890s a new factory was built in Caldwell Street (off Carrington Street) but tea rooms remained in Rundle Street. Further expansion occurred in the early 20th century, seeing Balfours move to a new factory site, on the corner of Morphett and Franklin Streets. Balfour’s son-in-law, Charles Wauchope, entered the business in the 1890s and later the company name became Balfour Wauchope Pty Ltd.
Balfours maintained this presence in the city until 2003 when manufacturing was moved to Dudley Park, a suburb in the inner north-west. As a kid growing up I remember being taken to Balfour’s Tea Rooms for a treat when we’d been shopping or even for lunch. My recollection of the interior is pretty much as it is in the photo, but I think it later changed to laminex tables and chairs. In 1972 the shop was said to be the busiest in the southern hemisphere. 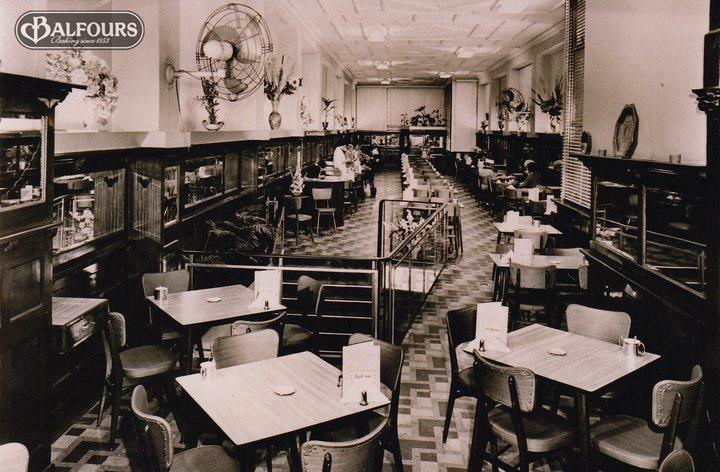 I know that people still talk about Balfour’s Tea Rooms today and tell their children and grandchildren about it. One of our early posts on the ARW Facebook website had posters recalling their memories. Janet Randell recalled “It was such a big deal to go into ‘town’ to shop. Always dressed up and if we were good, went to Balfours for a frog cake! Talking 1950’s here”! Barb Jamieson wrote “We lived in Broken Hill then, and Adelaide was our annual holiday destination . We always made the trip from Semaphore to the city at least once, and Balfours was always on our agenda. In those days you didn’t go to the city without your hat and gloves ,and your best outfit on , like Balfours , it was class all the way”. Deborah Morgan reminisced; “Even as it got old and run down, there was still a very special feeling, a sense of the past. The uniforms worn by staff, always looked crisp and clean. Sliding in and out of the booths was tricky, but part of the vibe. There was also place in I think in Gawler Place that had similar decor’. Many posters lamented the loss of so many of the places remembered as they were growing up in Adelaide in the 50s and the 60s, now nothing more than a distant memory. Today, one of Balfours’ signature products is the frog cake. This cake is also recognised as a South Australian icon. Balfours introduced the frog cake in the 1920s when the tearooms were popular. The cake consists of a sponge cake square coated in jam (the frog’s body) topped with cream (the frog’s head) and enclosed with the fondant icing. I remember this well. We were an immigrant family in the early 50’s and a trip to Balfours was a real treat in what was for us fairly hard times. Another great loss was Glover Gibbs who manufactured their excellent meat pies on the corner of Davis Street and Glynburn Road, Glynde. This in now the factory occupied by Robern Menz. My grandmother was probably the only person ever to be run over in Rundle Street by a cake trolley. I was recently going through some family papers, and found a letter to my grandmother from Balfours’ insurers, about an accident outside the Rundle Street tearooms. Whoever was trundling the trolley load of cakes across the footpath between a van and the shop obviously didn’t have a clear view, and knocked her down. She ended up with a broken arm, some compensation, and a story she dined out on for years. The experience didn’t put her against Balfours – she still bought us frog cakes for a treat. I am just slightly younger than baby boomers, but I recall that we almost never ate at the Balfours Tea Room, when we “went to town”, usually to get some new clothes, because it was always so FULL. Instead we used to go to the John Martins Buttery, up on the 2nd or top floor of Johnnies overlooking North Terrace. That was a wonderful institution too, dim, warm and mysterious. I preferred Balfours to Gibbs pies and pasties any day. I don’t live in SA at the moment but I spend lots of time seeking Balfours products in the supermarkets so I can show my kids that there aren’t any donuts anywhere that come close. Unfortunately they’re not that easy to find 🙁 I often had lunch in the Rundle St/Mall cafe and wish it was still there. Does anyone remember the coconut donuts and the square almond powdery slices that were out of this world?